Our banquet chairs come in many shapes, sizes and styles so you always have options when you plan an event! Good seating is vital for any celebration. This is where your guests will sit down to enjoy the festivities. If they are uncomfortable, that will detract from the experience. Old or damaged chairs can be a hazard in case a guest accidentally falls. The best way to be prepared is to make sure you have dependable banquet chairs on hand so everyone has a cozy seat! We have compiled a diverse selection of the best banquet chairs on the web. You’ll find unique styles as well as practical models that can be used for any purpose. 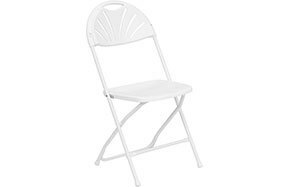 Our basic folding chairs are lightweight and offer an easy way to conserve on storage space. Just fold the chairs down and you’ll be able to squeeze many into a closet or other storage area when not in use. Multiple models are available in sleek black and pure white. Our padded stacking chairs offer a similar opportunity because the legs are angled so you can stack them one on top of the other. These chairs are wonderful for businesses as well because they are very sturdy and include a matching seat and back pad that makes them comfortable. 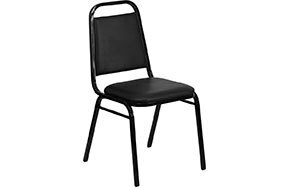 We also offer stacking banquet chairs with thicker pads. If you want something fancier, check out our vinyl stacking banquet chairs. This version includes a shapely back with a raised handle and beautiful, even color along the seat and back. The teardrop stacking chair is particularly elegant and makes a great choice for weddings and other high class events. Our banquet chair collection also includes Flash Elegance seating. These chairs are truly breathtaking, with a crystalline body and traditional spindle shape. 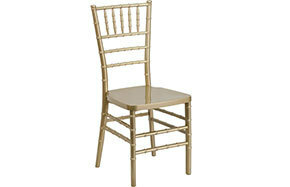 Solid white and supreme wood Chiavari chairs are also available. You can also choose from multiple Chiavari chair cushions to create a custom display that’s also inviting to guests! Explore our banquet chairs collection today and find the perfect seats for your loved ones.